Notice that although ne is always required in written French, you'll often hear it dropped in informal speech. I have quite often noticed that pas or other negative word is missing in written French, in newspapers and in books. I don't have an example at hand, though. Why is this and when can it happen? There are numerous occasions where ‘ne’ may be used without ‘pas’. I assume you are not referring to the ‘ne explétif’ but rather to cases where the ‘ne’ on its own invokes a true negative connotation (which the ‘ne explétif’ does not). This construction is often referred to as the ‘literery ne’ since its use is largely limited to the literary domain. 1. Certain fixed expressions and proverbs which are largely hangovers from medieval French. E.g. À Dieu ne plaise ! – God forbid! Qu’à cela ne tienne ! – Never mind ! 2. Certain expressions using avoir and être e.g. 3. The verbs cesser de (cease), oser (dare), pouvoir (be able), savoir (know (how to), when followed by an infinitive e.g. A useful acronym to help remember these verbs is COPS. These are just some of the situations where ‘ne’ may be used on its own, I’m sure there are many more which can arise. Thank you very much, Tom. That is a very helpful explanation and I now understand more about this. Am I right in thinking this use of the ne on its own is never used in speech? I would demur to the native speakers to detail the frequency of use in speech. This site purports to support learning up to level CEFR level C1. This being the case, users at the appropriate level should not be discouraged from exploring and/or utilising all registers of spoken and written French. Students attaining C1 will have displayed the necessary learning commitment to be equipped to embark on fully independent study and will usually be open to all means and methods of ameliorating their facility with the language. In my opinion discussion of any topic should not be curtailed on the basis of difficulty or register. If I may add to Tom's excellent comments, the 'pas' will not often be omitted in everyday language as it sounds very 'precious'. That's what I thought, thanks. I'll keep dropping the ne and keeping the pas in casual conversation! Not always required in written French, actually.
" Notice that although ne is always required in written French. " In games like Pokemon they can omit the " ne, " rather than having all the characters speak more formally all the time. So it's not always required, is it? Not in character dialogue. The rules are probably slacker in the world of games but in any dialogue form the speech would be written as spoken. I'd think dialogue would work similary to the way it does in English, where it ranges from some people being in the "Don't ever make characters say words like gonna and wanna even though we speak like this in real life" on one end of the spectrum and say, Twain's Huck Finn where dialogue is rendered almost phonetically, on the other. I have definitely encountered dropped ne's in dialogue. I noticed that, in lyrics of French songs, nes the singer doesn't say are still written out most of the time, whereas that is pretty much never the case when the Il in Il y a or Il y avait is dropped. That gets written as 'Y a/'Y avait. Maybe in a way it's like how we in English are more likely to write out if someone says 'cause rather than because but still write, say, working even if the singer pronounced it workin'. However, when I was playing The Walking Dead, ne's that weren't uttered weren't shown either but Il y a was spelled out though they did say 'Y a. Things seem to vary from medium to medium. Oh, subtitles with French are the worst! Whether it's Despicable Me 2 or Seinfeld, why do they think it's okay to have the French subtitles not at all match the French speech? Don't they write the subtitles based on the speech as it's being spoken? That doesn't make it easier to learn the spoken language when I'm hearing the subtitles being just paraphrased. Is that all the time or just bad luck? Can we omit 'ne' when we use 'plus' ? For example, 'je sais plus' means 'I don't know anymore'? 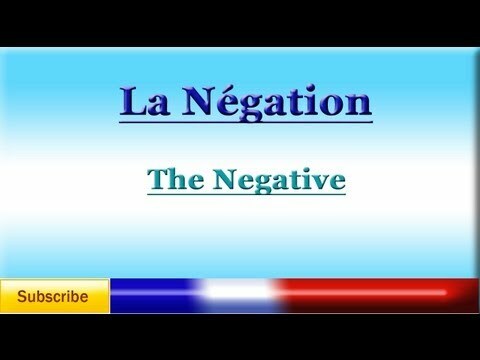 As Aurélie points out in the lesson, the «ne» is typically dropped during verbal discourse but not in written language. To my knowledge, this holds true with all of the negation structures. This is in the informal or familiar register of French. Written French is considered more formal register, the only exception being with textos, emails and tweets. However, if one does these, it is certainly not considered improper to include «le ne».